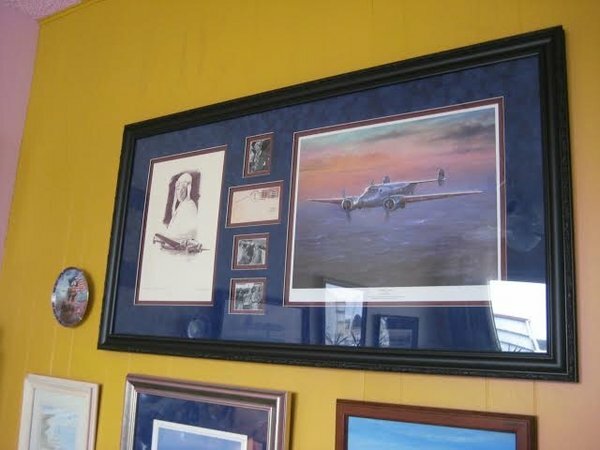 "AMELIA ENSEMBLE" with original signed First Day Cover envelope framed with photographs of Amelia - Original signed First Day Cover - Amelia portrait by Dan Witkoff and Electra print. 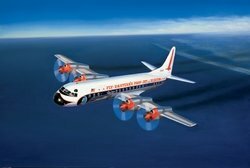 Image Size: 25.5" x 18"
Paper Size: 29.5" x 22"
While the Boeing and Douglas aircraft companies were concentrating on their respective new jetliners, the task of developing America's first turbo-prop airliners fell to the Lockheed Aircraft Company, of Burbank, California. The L-188 "Electra" boasted a 400 mph cruise speed- halfway between the propliners' stately 300 mph, and the stratospheric 500 mph-plus of the jets, which were quickly to come on the scene. With a range of 2,500 miles, the 168 Electras produced proved ideal for the intermediate routes of all the world's airlines they eventually served.